This was bought to an antique radio store. It did'nt work. 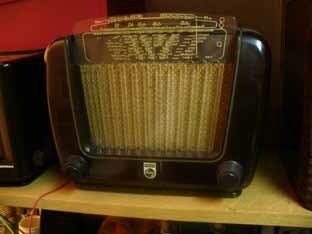 This radio has the particularity of design. My wife likes it very much and I put it at the standing room. It has a ring antenna which increases reception of medium wave without wires connected . Here the closest MW Transmitter is 25 Km distant and is 10 kW power on 963 KHz. All dial lights up at a vary nice efect at night. Valves : UY41 (mains rectifier) ; UCH42 ( mixer ) ; UF41 ( if amp ) ; UBC41 ( if ampl + rectifier) ; UL41 (output ).